one day from our ger at white lake we rode horses to this dormant volcano. 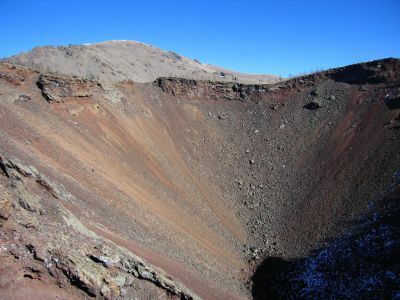 the crater was quite large and i was able to walk into it to take this photo, although our guide yelled at me a bit. chantal videos her husband guust as a herd of sheep and goats swarm around us during our return ride to white lake. no privacy, no door, no toilet paper, no sink, just a hole, two wooden planks, and three short walls. 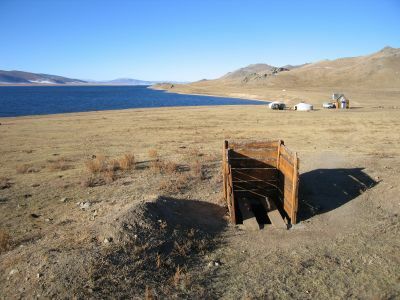 here we have a mongolian toilet at our ger alongside white lake. the bridges aren't much better than the toilets. 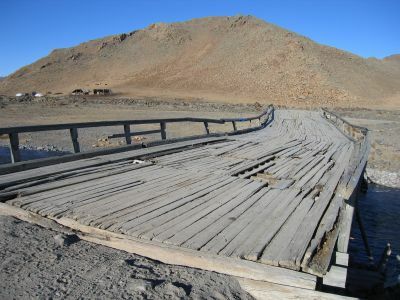 our russian van loaded with 2 weeks of equipment and 7 people precariously crept over bridges like this one. you often heard the boards creaking and squeaking barely, barely holding together. 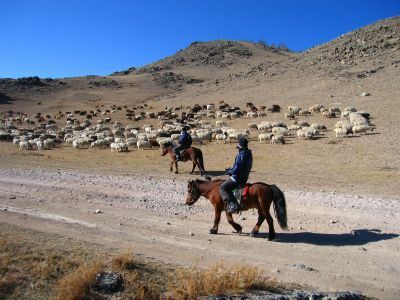 mongolia is a land inhabited by nomads. 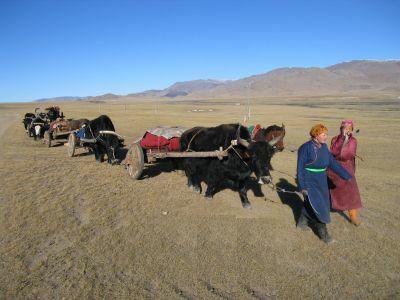 here two women lead a team of yaks hauling their homes and supplies to a better living place for the season. 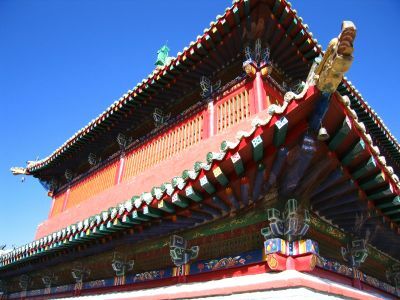 a building of a buddhist temple in mongolia. after touring a buddhist temple it's time for some korean beer. 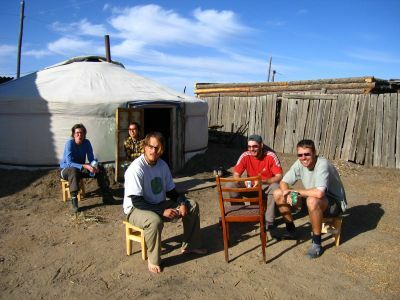 hanging outside the ger drinking some beverages with (from left to right), chantal, seok mee, me, hamish, and guust. continuing with our competitive nature we began to play hangman in the dirt after this picture was taken. that same night we were treated to a performance in our ger by a local throat singer. 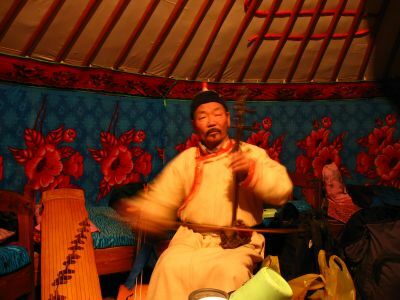 he played instruments, knocked his head, nose, and cheek with a small chunk of wood, and sang from way down in his throat. it sounded something like this: hhhhhuuunhnhnnnhuuuuhhnnhnhnhnhnhnnnhnhnnhnhhhhnnnnnn. after spending 3 weeks with me in mongolia i guess guust had just about enough. 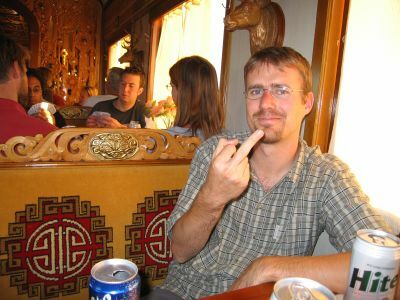 here we are drinking beers in the restaurant car of the trans-siberian railway from ulaan baatar to beijing, china. to my left, but not pictured, were sitting marie, camilla, charlotte, and neil whom i had not yet met but would end up traveling with for a month through china. strange how that works out here....it's a beautiful thing.